Happy Fourth of July! This week, we had the pleasure of interviewing Colleen Patrick-Goudreau for the blog. Colleen has dedicated her life to empowering people to make informed food choices, debunking myths about veganism, being a voice for animals, and giving people the tools and resources they need to live according to their own values of compassion and wellness. A powerful writer, talented chef, and exhilarating speaker, she is the author of five books, including the award-winning The Joy of Vegan Baking, considered the bible of vegan baking, The Vegan Table, Color Me Vegan, Vegan’s Daily Companion, and On Being Vegan. Colleen is the creator of the popular online multimedia program, The 30-Day Vegan Challenge; the host and producer of the life-changing podcast Vegetarian Food for Thought; and she delivers inspiring lectures around the country. She has appeared on the Food Network and PBS and is a contributor to National Public Radio and The Christian Science Monitor. 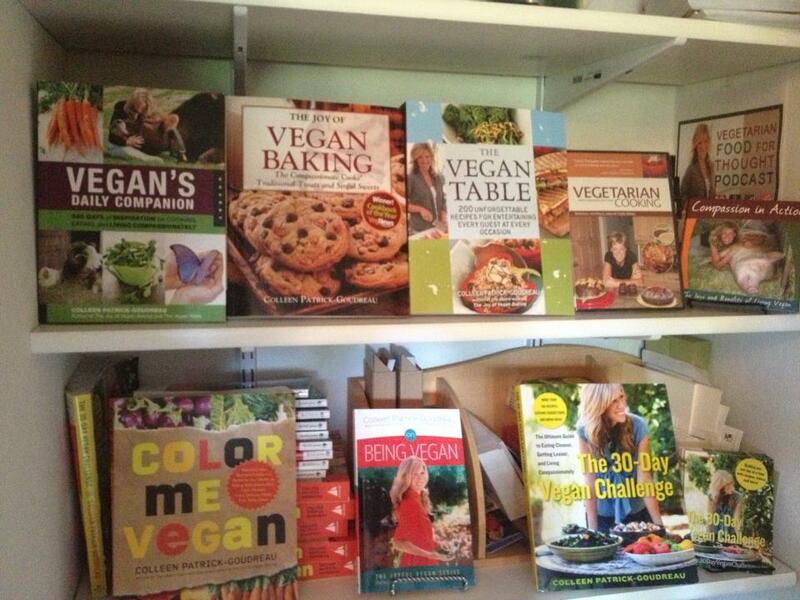 What led you to become a vegan author? I first became vegan when I woke up to the violence inherent in breeding, keeping, and killing animals for human consumption. My natural inclination was to be a voice for the animals and raise awareness of their suffering, and of course I started exploring how best I could do this. With writing and communication being my passion and skills (I received my bachelor’s and master’s in English Literature), speaking and writing were the obvious answers. I manifested these skills through my cooking classes, podcasts, and subsequent books. I’d always wanted to be a writer, but I didn’t know what that was going to look like; after graduate school, I just knew I wanted to be able to dedicate my life to helping animals and empowering people, and I’m so grateful to be able to do that. What would you like your books to accomplish? My ultimate goal in my work is to change the way we think about non-human animals. I believe that our ill treatment of them stems from a mindset that says animals are here for us – and thus we can do anything we want to them. My intention in my books – in all my work – is to speak directly to the compassion I believe is in all humans in order to empower people to think, live, and act from that compassion. Once we change our thinking, we change our behavior. The solution to violence against animals is compassion in people. That’s what I focus on. What do you think is the most effective way of increasing awareness in non-vegans? Well, I do believe that compassionate communication and humility are the most effective ways of increasing awareness. It’s not just about raising awareness about animal suffering; it’s about raising someone’s awareness of their own capacity for compassion. I spend a great deal of time talking about “speaking your truth,” walking the line between speaking up for the animals and being proud to be their voice but also remembering where you came from. When we talk to non-vegans, we absolutely have to remember that we, too, were once unaware – that we, too, once ate animals or went to the zoo or wore leather and fur. If we forget where we came from, we risk becoming arrogant and self-righteous, and I think that’s the worst attitude to have when communicating with non-vegans. As far as specific types of advocacy, finding what suits you best is going to make your message the most authentic for you. Some people are wonderful one-on-one, some people want to speak to large crowds, some enjoy working on legislative issues and lobbying and others communicate via food and recipes. They’re all important, and the thing that will make them most effective is how much you enjoy doing them. Make no mistake about it, passion moves people, so share whatever you get most excited about with others and your passion will inspire and move them. If you only had one meal to prepare to show someone how wonderful vegan food can be, what would you choose? My intention in all of my recipes is to take veganism “out of the box” to demonstrate that “vegan food” is food people already know and already love – it’s not unfamiliar. So, I love sharing dishes (savory or sweet) that are very familiar to people so that their reaction is “oh, I already make/love/eat that; I had no idea it was vegan/veganizable!” It’s this experience that shifts people’s thinking. It’s all about changing the way people think. In addition, my mantra is “if it tastes good, they will eat it.” The bottom line is that if it tastes good, tastes familiar, and fills people, they are satisfied. It’s very simple. So, having said that, one of my go-to dishes to make for parties with mixed guests is my Better-Than-Tuna Salad (chickpeas) or similarly my Tempeh Pate. Both are made with eggless mayonnaise and crunchy veggies and salt. Now, in terms of the tempeh, I know it sounds like I’m using unfamiliar ingredients, because tempeh is still not widely known to the general public/palate, but because the texture, flavor, and fat profile IS very familiar, people go NUTS for it. That’s why it doesn’t matter than I’m using an unfamiliar ingredient; I’m shooting for a familiar palate EXPERIENCE. That’s also why I stand by the fact that it’s not animal-based meat and dairy people want: it’s fat, salt, familiarity, flavor, and texture. That’s why people can “trick” family members into eating “vegan food.” It doesn’t matter that it’s not made from animals; it just matters that it’s good! Tell us about your latest book, On Being Vegan. 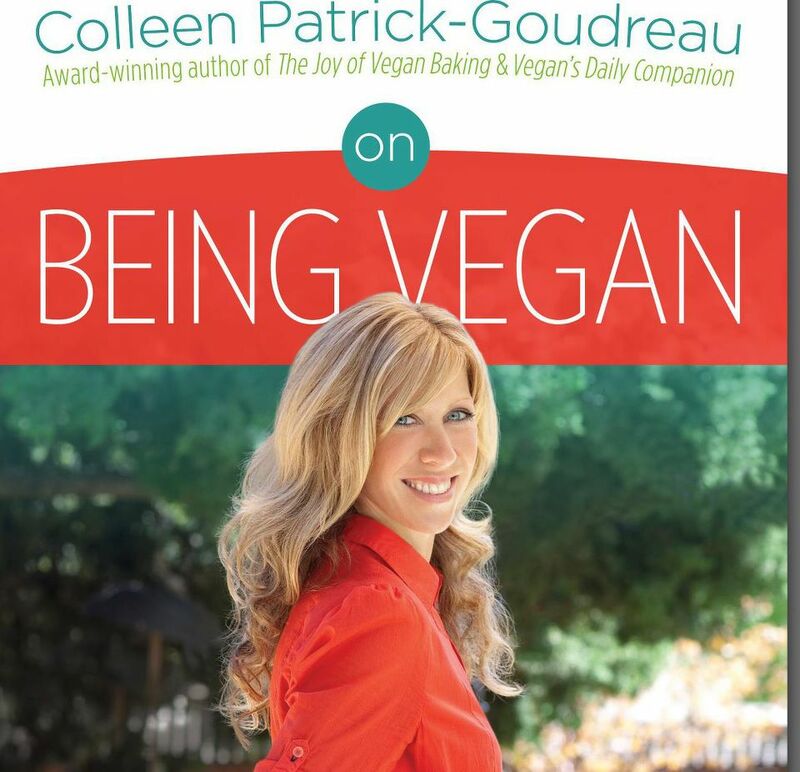 On Being Vegan is a collection of essays that were born out of my talks and podcasts in order to get to the heart what it means to be vegan. I want readers to realize that veganism is attainable; it’s about intention not perfection, about living according you your own deepest values of kindness and compassion. I answer some of the typical questions, including “what about free-range eggs or eating eggs from sanctuary chickens”, etc. I do think it’s the perfect book for vegans to give to non-vegans to convey what being vegan is all about. In addition to continuing to baby my existing projects – my existing books, my ongoing podcast, and my online program, The 30-Day Vegan Challenge – I’m working on a number of books. I’ll be doing some traveling and speaking, but I’m focused mainly on writing right now. What is a typical day like in the life of The Compassionate Cook? I’m an early-riser and a morning-writer, so first thing is tea with my husband on the patio, then I read a bit, have breakfast, and start writing. I tend to write for a few hours in the morning, then head out at lunchtime for a 5-mile run. I return back home to eat, spend some time my kitties, then usually venture back outside to write some more – whether it’s a podcast episode, book proposal, op ed, or book manuscript. Of course, all of this gets balanced/broken up by the classes I teach for Dr McDougall, responding to emails, managing administrative tasks, having meetings, and taking interviews. Can you think of a recent time where someone tested the limits of your compassion? How did you respond? I would say the most challenging experience I’ve had in terms of testing my compassion was when I volunteered to patrol the border between an animal sanctuary and government land where a “dove shoot” was taking place. I stood there all day watching men, women, and even children shoot doves out of trees, making sure they didn’t shoot over the property line and taking any birds who fell over on our side to the hospital. It was most challenging, and I realized I had a choice to either stand there all day angrily judging these people or find compassion for them. I chose the latter. I chose to stand with my arms at my side or behind my back, presenting an open stance rather than a closed one with my arms crossed over my heart. I chose to silently wish for compassion to enter their hearts and sent my own compassion to them. I did this over and over and over, and aside from the fact that I reflected my own compassion, I also noticed a shift take place on that field. Where the men had been antagonistic at the start of the day, they had become almost apologetic by the end. I tell the full story in a podcast episode called “How to Talk to a Hunter (Or Anyone Else with Whom You Disagree).” It was an incredibly valuable lesson in truly understanding that compassion isn’t compassion if it’s reserved only for those you like or who agree with you. True compassion means extending it to those who are hardest to have compassion for. Do you have any other specific talent(s) that most people are unaware of? Such a hard question. Favorite novels: The Octopus by Frank Norris, The Confessions of Nat Turner by William Styron, The Road by Cormac McCarthy, Their Eyes Were Watching God by Zora Neale Hurston. Favorite nonfiction: For the Prevention of Cruelty: The History and Legacy of Animal Rights Activism in the United States by Diane Beers; An Unnatural Order by Jim Mason; and Tao te Ching by Lao Tzu. Care to share a 4th of July recipe with our readers? Try the Curried Better-Than-Chicken Salad for a tasty 4th of July vegan picnic dish! This is a sure-fire crowd pleaser. The eggless mayonnaise adds creaminess, the apples and raisins add sweetness, and the tempeh provides a satisfying texture. Steam the tempeh for 10 minutes in a steamer basket placed in a pot filled with a small amount of water. Let cool completely before adding dressing ingredients. Combine the tempeh with the celery, apple, raisins, nuts, curry powder, salt, and peppers in a large bowl, adding more or less mayonnaise, to moisten according to your taste. Cover and refrigerate until it’s time to serve, at which point you may need to add some more mayonnaise. *Add some chopped pineapple for a tropical flair. *Try coarsely chopped water chestnuts in place of the walnuts and pecans. Reprinted from The Vegan Table with permission. (c) Colleen Patrick-Goudreau/Compassionate Cooks, LLC, 2013. All rights reserved. Thanks for this great interview. I have heard of some of your books but haven’t purchased any. I will definitely be buying them after reading more about you and seeing your recipes and ideas. Yummy!